Just a couple more days of relaxing, then we’re heading back home to Canada. It’s been a blast and huge success here in New Zealand. Katie and I have really enjoyed some relaxation time while down under as we prepare to be new parents. We’re very excited to take on this new journey together and we feel so blessed to live where we do, have the opportunity to travel and bring value to farmers around the world, be surrounded by incredible and positive people and of course have our health in tact. These are things we never take for granted and are thankful every day. I want to send a whole hearted thank you to everyone who has been involved in bringing me to New Zealand for the second time around. Particularly, Jodi and Tanya Roebuck for being great hosts and friends, Linda Machon for being an incredible cook for our event, and last but not least, James Samuel for being the grand architect. Without him, I wouldn’t of been down here in the first place and met all the great people that we have. James has been the major force behind scaling up the interest of small scale ag here in New Zealand. It seems like there is a serious buzz happening down here now and I believe the opportunities are huge. Though, there are some logistical challenges for farmers here such as ordering some of the tools that we use in North America, but I will say that with all of this new interest and growth, many American companies that I know personally, are looking to cater to this emerging market and if more farmers pool their resources, larger purchases can be made in collaboration to avoid the high costs of shipping. Katie and I will definitely be back in 2018 as a small family. It’s looking like it’s going to be January, though the dates aren’t 100% confirmed yet. My next events will be in Victoria, BC the weekend of the 25th and 26th at Royal Roads University. The first day (Saturday), I will be giving my 1-day Profitable Urban Farming workshop, which already has 45 people registered. The second day (Sunday), will be my 1-day Microgreens for Commercial Production workshop and it is now sold out with a waiting list. It’s a partly hands-on workshop, so we have to keep it small because 2 hours of it will be in a greenhouse on the campus. The following weekend, I will be back in Boston for the 5th Annual Massachusetts Urban Farming Conference. I will be the keynote speaker this year to open the conference and then giving three content packed workshops about specific small farm based topics. More info here. After these dates, I’ll be taking a touring hiatus to be with Katie and focus on having a successful birth of our eagerly awaited child. However, this summer will be the start of my new 5-day workshop platform on my farm. One workshop in each month of June 19, July 17, and August 14. All the information can be found here. Come fall and winter, I will be focusing more on teaching 5-day courses at farms throughout the US. October 13th, 2017, I’ll be back at Rose Creek Farms in Selmer, TN and November 6th, 2017 at Steadfast Farm in Queen Creek, Arizona. Tickets will be on sale for these events this month. Here is a rough outline of the workshop and what you can expect. Join Curtis Stone (author of The Urban Farmer) for his most intensive and thorough workshop to date. This five-day course is the cumulative content of all of his best techniques used at his farm Green City Acres, but also what he’s learned from traveling and visiting some of the most successful market gardens in North America and abroad. This is a technical, practical and hands-on course. 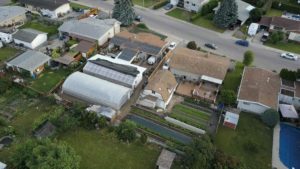 Hosted at Curtis’ own farm, Green City Acres, you will see every aspect of his highly productive urban farm demonstrated in the field. Everything from preparing beds, planting, harvesting, post-harvest and everything in between. These five days will be the last thing you need to completely get your farm started strong or radically improve what you’re already doing. Everyone who enrols will be given a free digital copy of Curtis’ one day workshop prior to starting, with 12 hours of content to watch at their leisure, a $200 value. Taking the one day course before the five day event, will give you a head start so that you’re familiar with all the concepts. That way, we can jump right in head first and get down and dirty! Participants will be responsible for their own accommodation, but the event will be catered each day with coffee and biscuits in the morning, and a full buffet style lunch, and a light snack late afternoon. Because our farm has multiple locations, we will be riding bikes between sites. We will provide the bike for you, if you don’t have one to bring. All food provided will be local and organic from Green City Acres and local farms from the area. Gluten free and vegetarian options will be available for those open request. The course will be taught in a classroom setting for the mornings, then the afternoons will all be spent in the field at our various urban farm sites. 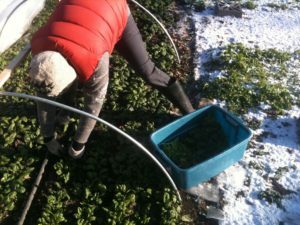 Special discounts are available for members of Curtis’ online course Profitable Urban Farming, and for those that want to take the 5-day course and sign up for a membership. Space is limited to 18 people, so sign up fast! Curtis Brief intro to work stations, infrastructure, fields & tools. Introduction to infrastructure and systems. Social media, websites, blogging, and content based marketing. Join Curtis Stone (author of The Urban Farmer) for his most intensive and thorough workshop to date. This four day course is the cumulative content of all of his best techniques used at his farm Green City Acres, but also what he’s learned from traveling and visiting some of the most successful market gardens in North America and abroad. This is a technical, practical and hands on course. Hosted at Roebuck Farm, in New Plymouth New Zealand, you will see every aspect of market gardening demonstrated in the field. Everything from preparing new land, planting, harvesting, post-harvest and everything in between. These four days will be the last thing you need to completely get your farm started strong or radically improve what you’re already doing. Everyone who enrols will be given a free digital copy of Curtis’ one day workshop with 12 hours of content to watch at their leisure, a $200 value. Taking the one day course before the four day event, will give you a head start so that you’re familiar with all the concepts. That way, we can jump right in head first and get down and dirty! Space is limited to 33 people, so sign up fast!